I have just left Bouchercon 2018, and I already want to go back. It was a lovely weekend, full of deep connections, new friends, and lots of strategy sessions with my team. Nothing beats a face-to-face. I was also able to hang out with so many cool people. I don't even want to try and name everyone, but there are lots of pictures online. I'll try to post a few myself now that things are calming down. But major love to some of my buddies for taking such good care of and entertaining this VERY exhausted writer: Laura Benedict, Randi and Boyd Morrison, Eileen and Bob Hutton, Molly McCaffrey and David Bell, Karen Lonsdale, Emily Carpenter, Kimberly Belle, Wendy Heard, Hannah McKinnon, Rebecca Drake, Carla Neggers. Rick Mofina, Heather Graham and Dennis Pozzessere, John Gilstrap, Reavis Wortham, Sherrie Saint, Nicole Brebner, Margaret Marbury, Shara Alexander, and the FANTASTIC crew at the Birchwood Inn, you held me up all weekend long. Thank you. The bulk of the tour is nearly done, only SIBA this week, and then I've diving back into the revisions for THE LAST SECOND with Catherine. And then... nope. Not telling just yet. But keep your eyes peeled. News coming soon! A Study Of NYT's "By The Book" Shows That Male Authors Are More Likely To Recommend Other Men. I find this very interesting. Yes, men read men, women read women, never the twain shall meet -- except...... I've always had a lot of male readers, and I have been so blessed by the male writers who have guided my career, blurbed my books, shared with their readers as well as the female writers who've done the same. Empirical evidence being what it is, yes, we can all do better. But I hate to paint everyone with the same brush. Crime fiction writers are incredibly diverse in their reading habits, and I've never felt marginalized by them. No One is Thinking About You, So Stop Giving a F@*k. "You should not let the opinions of individuals who do not have a vested interest in you be the reason for your inaction. They don’t truly care about your success, so why should you care about what they think?" Amen. Amen. Amen. Hugo awards: women clean up as NK Jemisin wins best novel again. Stunningly wonderful books — this is awesome! My dad is a HUGE fan of this series. What Do They Want from Us? On the Return of Big Bookstore Chains. "For book lovers, a new chapter is just starting to unfold." Hey, we all need more bookstores. I'd like one on every corner, please. 'The Little Stranger' novelist Sarah Waters talks haunted houses and awkward heterosexuality. Looking forward to seeing this on the screen, too! TEAR ME APART has really been connecting with readers. I'd hoped and prayed it would, and I have been so incredibly touched by the wonderful reviews and emails I've been getting. Thank you all! International Thriller Writers did a wonderful feature of TEAR ME APART in The Big Thrill. It was so much fun to sit and think about all the facets of this story. And, just in time for the holidays.... (Sorry, I had to) signed copies are available from VJ Books, Parnassus Books, and Murder By The Book. And as I mentioned, I'll be with independent booksellers at Southern Independent Bookseller Association 2018. I am so looking forward to connecting with everyone! You can find all of my remaining book tour events here. Finally, have you read my novel WHERE ALL THE DEAD LIE? 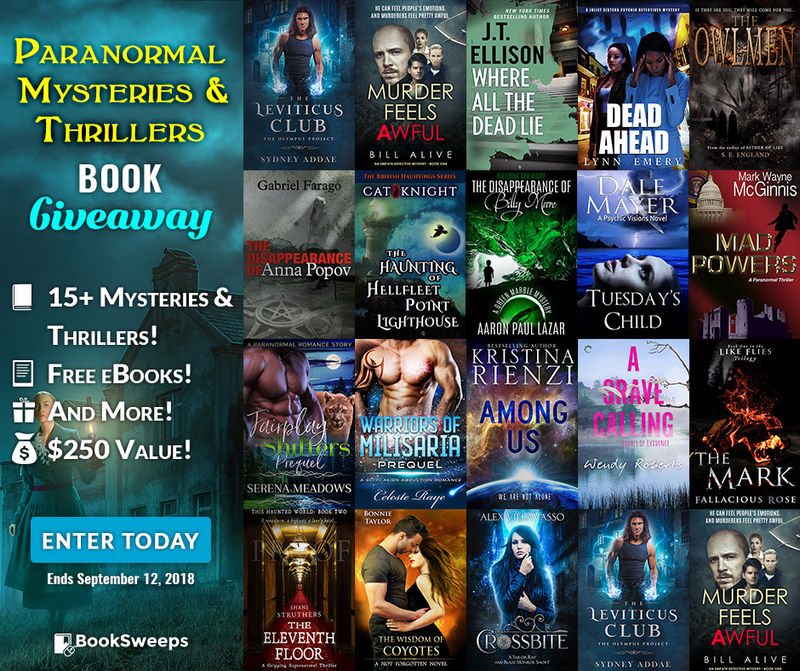 Booksweeps is giving it away, along with 15+ fantastic Paranormal Mysteries & Thrillers from an amazing collection of authors, PLUS a brand new eReader- along with a collection of FREE reads just for entering! Enter the giveaway here. Wow, can you believe summer is nearly gone? Enjoy the nip in the air at night, start a new notebook for the school year, and we'll talk again soon.